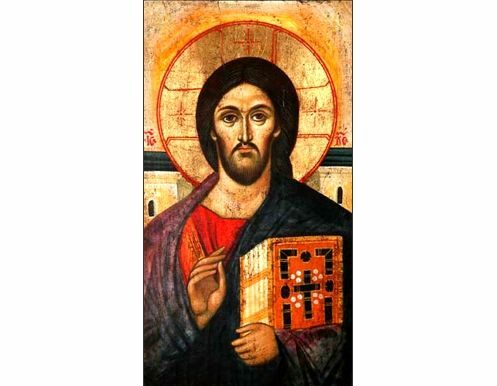 A famous Greek Orthodox icon of Jesus Christ, handmade & hand painted by an expert Greek hagiographer. It is the oldest known surviving example of the icon of Christ Pantocrator and was originally painted in encaustic on panel in the sixth or seventh century, and survived the period of destruction of images during the Iconoclastic disputes that twice racked the Eastern church, 726 to 787 and 814 to 842, by being preserved in the remote desert of the Sinai, in Saint Catherine's Monastery. The two different facial expressions on either side emphasize Christ's two natures as fully God and fully human. Made using traditional materials (selected aged timber frames, egg tempera, 24K gold leaf, natural powder paint and varnishes) and old techniques. It is an exact reproduction of an antique Byzantine masterpiece. The icon bears the artist's signature on the front and the certificate of authenticity on the back.